From December through March, the Saijo area west of Hiroshima has an average temperature of 38 degrees Fahrenheit with low humidity. The water is mildly alkaline. The rice is good. It is one of the most favored brewing locales in the entire Japanese archipelago. 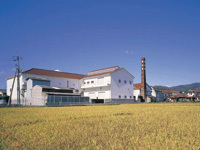 The Maegaki family, who run the Kamoizumi brewery, started out as rice farmers who became landlords and then moved into "value added" areas such as rice milling and eventually sake brewing at the onset of the modern era in 1910. In 1965, Kamoizumi became one of a pioneering group of ten breweries who committed to junmai sake production at a time when breweries all over Japan were heavy-handedly adding brewers alcohol to their vats to make as much money as possible. In 1971, Kamoizumi introduced its first junmai label. At the time, it was the practice to filter the pressed sake through charcoal to remove impurities and attain the pure, colorless state that was the aesthetic ideal. The Kamoizumi brewers felt, however, that these "impurities" were essential characteristics of the sake itself and that to remove them entirely was to compromise the essential nature of its identity. No brewery in Japan has taken a stronger stand for individuality than Kamoizumi. Their sake has an attitude: robust, tawny, full-flavored, yet with the smooth finish and easy drinkability that are the hallmarks of technical mastery. Aging and blending are paramount, and when finally released, the Kamoizumi labels pair well with meat dishes and Chinese cuisine, a rarity in the sake world. For the connoisseur, their supple balance of sweetness, acidity, astringency and the elusive flavor component of "umami" is without peer.